It has been just over three years since we opened our doors in Boardman. In that time we have been continually looking for ways to increase our quality, and expand our offerings. As we continue to learn more about coffee roasting brewing and extraction technology, we want to share our progress along the way. We hope that coffee quality can improve among the industry professionals, and home coffee brewers as well. With that, let’s talk about our new Strada EP espresso machine. While most people were enjoying their Labor Day weekend, several of the Branch Street team went to work. We took advantage of the holiday to install our new espresso machine, the LaMarzocco Strada EP. This is considered the most advanced espresso machine available on the commercial market. To our knowledge, less than 100 of these models are in service in the US. To understand what makes this machine so advanced, we need to understand a little bit about the history of brewing espresso. A barista brews coffee on a traditional espresso machine. Traditionally, espresso was brewed on lever-action machines. These machines begin brewing when a barista pulls down on a lever to allow water to contact the coffee. When the barista let go of the lever a high-tension spring would pull the lever back up. This action would force the water to flow through the coffee under pressure. As the lever drew closer to the home position, the spring tension would gradually decrease. This would reduce the pressure on the coffee towards the end of the shot. These lever-action machines would produce a pressure curve. High pressure up front, and gradually lower pressure at the end of the brewing process. The pressure applied to coffee would vary from one machine to another, as the springs would wear out over time. 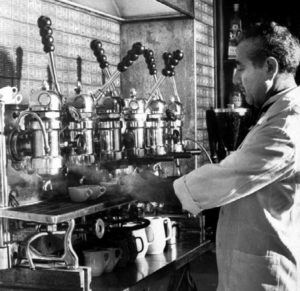 This was the standard espresso brewing method until more modern push-button machines came along. When push-button (semi-auto) machines became more widely available, the varied pressure of lever action machines became viewed as undesirable. The new machines used highly accurate rotary pumps to apply an even pressure until the brew was completed. One pressure was set, and this pressure stayed the same during the brewing process. Most espresso machines still use this technology worldwide. One of the most recent improvements to the coffee program at Branch Street is the addition of our new espresso machine, the Strada EP. This is a pressure profiling machine, which allows us to adjust the water pressure that is applied to the coffee during the brewing process. While we are still able to brew the usual espresso using one pressure, we can also take control of the pressure and adjust it during the brew to change the flavor of the coffee. 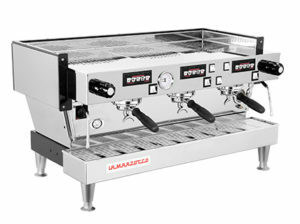 The classic La Marzocco Linea. We immediately set to work, trying several different pressure profiles, and learning how adjusting the pressure at different points in the brewing process would affect the flavor in the cup. We began to see some patterns in the flavors using different pressure designs after a few hundred brews. These discoveries helped develop unique profiles for each coffee we are brewing.What truly makes this machine remarkable is the ability to save these profiles and program them into memory. Every time we brew a particular coffee the barista can use the specific profile designed for that coffee. The Strada has allowed us to take total control over the brew process, to ensure that we consistently brew the coffee, shot after shot. The takeaway? By varying the pressure applied to coffee during the brewing process we can have an affect on the flavor and quality of the espresso. When we use this to our advantage we can achieve unique and beautiful espresso drinks far beyond what is capable with a standard machine. If you want to take the difference for yourself try a single-origin espresso with our Ethiopian Sidama. We will keep this blog updated with our theory and discoveries as we learn more about pressure profiling and espresso flavor. Reach out to us if you are considering purchasing a pressure profiling machine for your cafe. We’d love to share what we’ve discovered along the way. Let’s push the limits of what is possible!